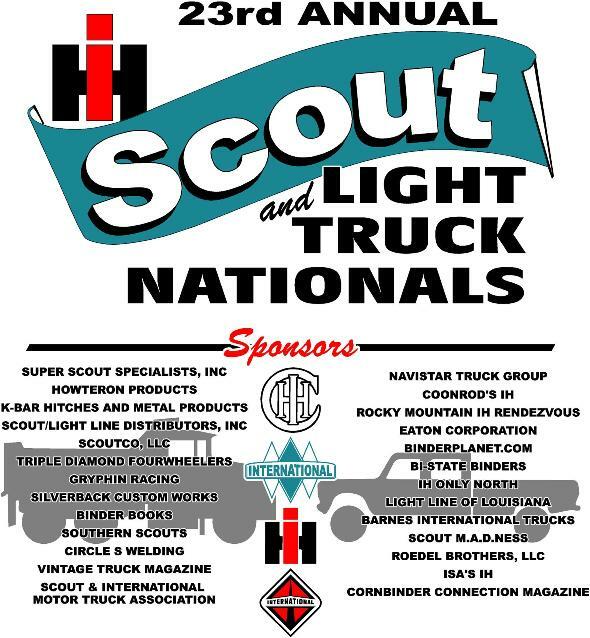 2017~Show Sponsors: Super Scout Specialists, Scout/Light Line Distributors, Inc.., Navistar Truck Group, Scout Connection, Scout M.a.d.ness, Southern Scouts, Circle S Welding, Triple Diamond Fourwheelers, IH Parts America & CPT, Anything Scout, Coonrod‘s IH, BinderPlanet.com, RMIHR, BI-State Binders, ScoutCo Products, K-Bar Hitch & Metal, Silverback Custom Works, Roedel Brothers LLC, Barnes International, Vintage Truck Magazine, Coonrod’s IH, Cornbinder Connection Magazine, Hamilton Fuel Injection, Historic Waco Field, Sierra Fall Rallye, Rough Country, Texas Scouts, SunFrog Shirts, Binder Boneyard, Dirty Dale’s Diesel, Scout Pro ( Jim Maulus JR), Gulf Coast Binders, Back Country Binders. 2013 Special Mention: Navistar, Auto Custom Carpets, Hagerty “Classic Car Auto“ Insurance, Summit Racing Equipment. 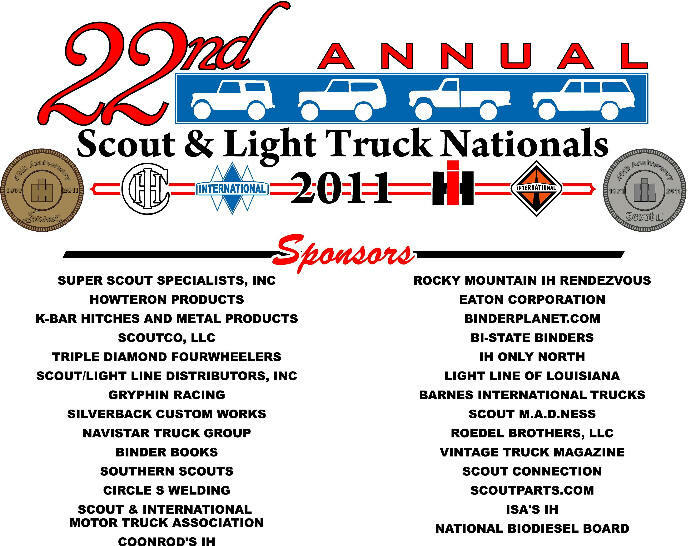 2012 Special Mention: Navistar, Auto Custom Carpets, Hagerty “Classic Car Auto“ Insurance, The Scout Connection.